WWII SARD Mark 21 7×50 binos, complete with rubber eyecups and leather binocular strap. These binos aren’t particularly collectible, nor are they very expensive, but they are a nice pair of WWII 7×50 US Navy BuAer Mark 21 binoculars. I liked them because they have flip out amber filters and shaped rubber eyecups. Despite my own advice to never buy binos off ebay again, I bought them off ebay. The seller is same fellow from whom I bought my 1960s/70s Binos Prismatic No2Mk3 6×30 binoculars a week or so ago. I was very impressed with those binoculars and I was not disappointed with these ones. 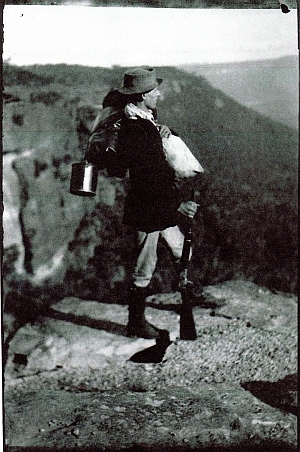 Bushwalking in the Old Style – Australian conservation pioneer Myles Dunphy in the Blue Mountains in 1915. Dunphy and his companions traveled the length and breadth of New South Wales’ wilderness areas in the first half of the 20th century, often living for weeks at a time out of a traditional Aussie swag bedroll. In a few weeks I’ll be participating in an event with a rather odd name – “Bushcraft Challenge – Hootchie & Swag Low-Tech Overnight Bushwalk”. Unlike most recreational hiking trips, this one has rules covering the types of equipment used.